In Camden you have everything that’s not normal, but it all makes it feel like normal. It’s normal in its abnormality. So in Camden Lock Market there’s a place for outdoor screenings, in other words: an abnormal cinema. You can choosea beach chair, but I would suggest the beanbags on the front row to make yourself comfortable. You better check the weather in advance or it could be a wet evening. Collect some friends, collect some drinks, grab your swimsuit and choose the right hot tub that will be yours for the entire evening. If no friends available then use this opportunity to jump in one of the hot tubs and make some new mates. Just hand them a few beers and before you know you’re settled in their tub. Don’t forget to take a look at the amazing view when you’re on top of a building. And oh yeah, they play a film as well… This open-air cinema only takes place during summer. There’s a bar, you can put on headphones and there is that amazing view which gives the whole experience that extra touch. 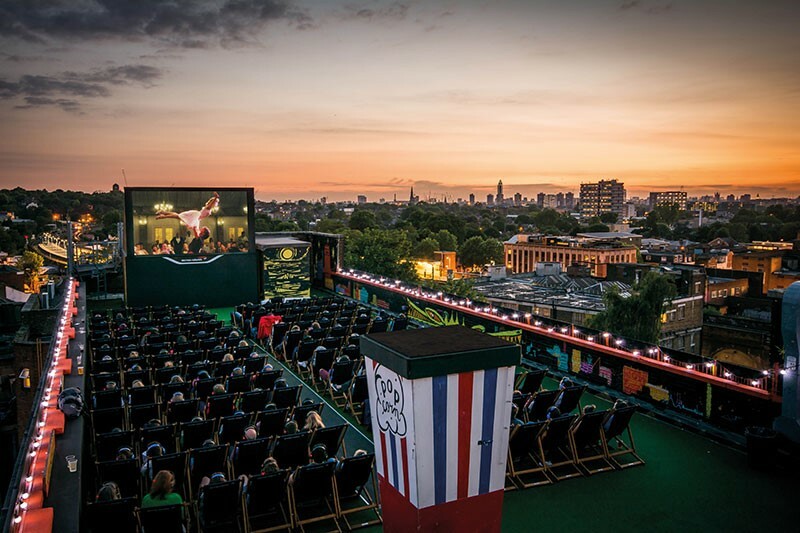 The Rooftop Film Club surprises you by choosing different locations with different views of London’s skyline. You’re not really into overground things, but fancy the underground? Well, I do understand you. It’s just so much cooler isn’t it? This pop-up cinema (only during Winter) is located under the railway vaults of Waterloo station. Headphones are waiting for you in those typical theatre chairs. You can expect a large variety of old and new films for every taste. You like it posh, expensive and a bit more exclusive? 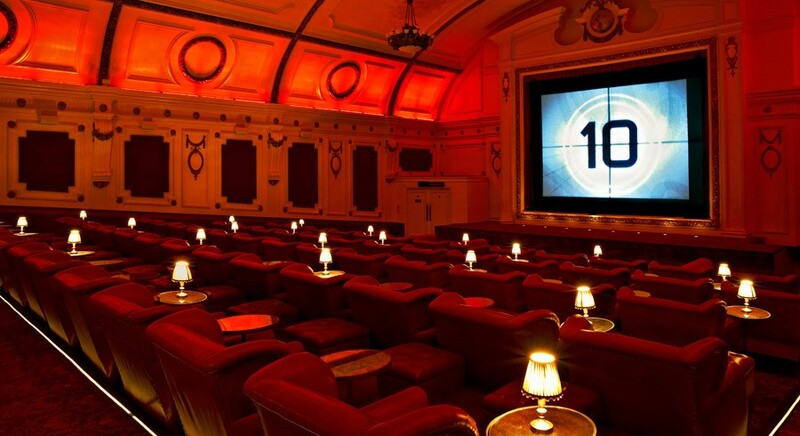 You don’t like ‘regular’ cinemas? Yeah, then this one’s yours, mate. There’s a bar to order food and drinks but never mind, why would you put an effort? You can order your snacks whilst sitting in your seat and oh my god, they even deliver it to your chair. 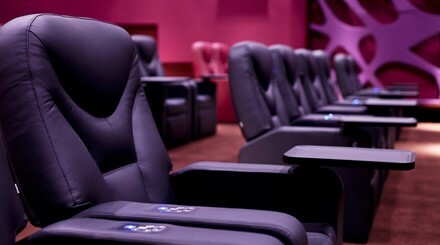 This luxury cinema is situated in the shopping centre Whiteleys. Small point of personal criticism: purple is not my favorite colour (but who cares when the lights go out) and the interior reminds me a bit of a plane. If the British weather is in its grumpy mood (and that happens quite a lot), then this special cute indoor cinema could be your hero! This popular art house cinema shows films from past and present, from alternative to mainstream. In this building from 1861, the venue creates an intimate atmosphere what makes it all even more enjoyable. How cool is this open-air cinema? What’s better than a beautiful summer evening where you and your friends can chill out, accompanied by your favourite snacks and drinks, and watch a good film? The courtyard of Somerset House, with full surround sound, is the place to be. Also for those interested in arts, fashion, music… this cultural centre could be a good option to visit during the day. You would expect a theatre, a musical, an opera or a gig, but not a film screening. 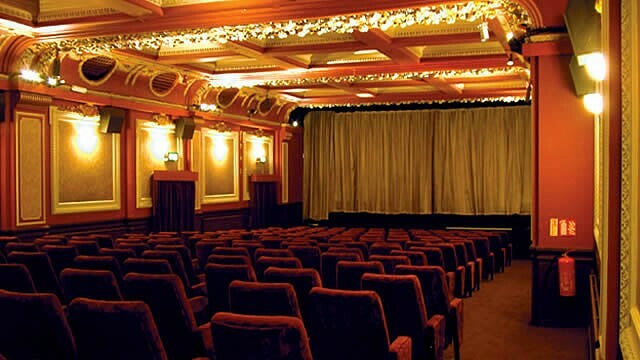 Though, from the moment the curtains open you’ll get to see a big screen and your chosen film will start to play. Not sure whether this is the best way to watch a movie but the venue in this historic building is definitely worth a visit! I end this list with a special one. Secret Cinema organizes screenings on secret locations you only get to know on the day of play itself (if you’re registered on their website). Locations are chosen based on the genre of the movies. If Halloween’s on the way, you can expect a graveyard to spend the evening. On the other hand, you can also end up in a fancy car park. No picture can be shown here as it’s…secret. Follow London is your oyster on Twitter and Facebook for more London news!